With a lifetime of precious experience packed into a super-successful 20-year career of having co-founded and spearheading Eastern India’s biggest entertainment company SVF Entertainment with its co-founder Shrikant Mohta, Mahendra Soni, Director& Co-Founder – SVF Entertainment Pvt Ltd, has been a visionary Media & Entertainment Leader one had been waiting to connect with for some time now. The man is both, dynamic, and, going by his boundless energy, literally a dynamo, who, at 44 years, embodies ‘young veteran’. Mention the name ‘Moni ji’ to anyone who has anything to do with the film industry in Eastern India, and they will likely know you’re referring to Mahendra Soni. At SVF Entertainment, which has traditionally been driven primarily by its phenomenally prolific and successful movies business, Soni heads Films, Television, Distribution, Cinemas and the Music businesses. Having produced numerous Bengali films that have won multiple National Awards and also bagged several other prestigious awards, Soni has made a mark for the company not just in East India, but nationally too. 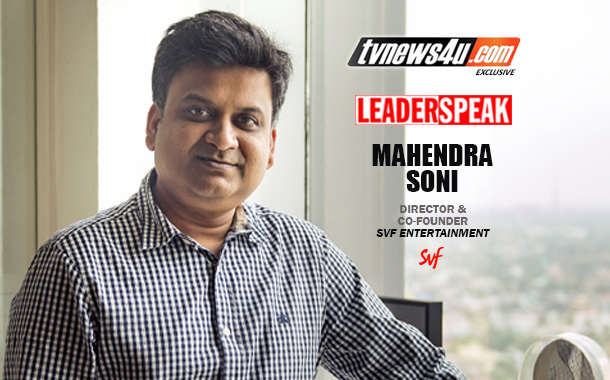 He has also driven SVF’s distribution arm to phenomenal success, and on the Television front, has turned Music India, Sangeet Bangla and Sangeet Bhojpuri into leading Channels within their respective segments, with his understanding of the audience. Soni, who, like his partner Shrikant Mohta, has phenomenal relationships with all factions of the industry, also drives satellite and music syndication deals along with film acquisitions. He plays a key role in significant business associations for SVF across all divisions. And he speaks his heart with immense passion when it comes to the entertainment industry in not just Bengal but eastern India. Here are excerpts from a rewarding, insightful conversation. From first thought of the idea to the founding of what became eastern India’s biggest entertainment company, i.e. SVF Entertainment, what was the journey like? Please recount the first days, first success and how SVF became what it is today. 20 years in less than 20 lines. We started way back in 1995. We were two young energetic boys, Shrikant Mohta and myself, who were still in college and pursuing their bachelor’s degrees in commerce, who decided to become dream merchants with no idea whatsoever of how to sell dreams. Films happened as if by divine intervention. We flew to Mumbai to buy the distribution rights to Mani Ratnam’s film ‘Bombay’, and against all odds, we succeeded. A year later, we forayed into film production. The initial films did not fare well at the box office, but that never stopped us. Then came the blockbuster ‘Shoshurbari Zindabad’ in 2000. Three years later, we received the National Award for Best Bengali Film for ‘Chokher Bali’ in 2003. We realized then that we were slowly but steadily beginning to achieve what we had dreamt of as two young college boys. In 2007, we launched the music channel ‘Sangeet Bangla’, which went on to become the Number One Bengali music channel of India. Then, in 2008, we started off our Television production with three series in 2008. In the same year, we launched Qube Digital Cinema in Eastern India. Two big achievements happened over the last two years, starting with the inauguration of the first theater of our Cinema chain SVF Cinemas in 2016, and more recently, in September 2017, the launch of our OTT platform, Hoichoi, the biggest online Bengali-content-driven entertainment hub. Having launched India’s first and biggest Bengali-only app Hoichoi, which has a large library of Bengali Feature Films, what do you think of the explosion in the OTT space in India? How will the explosion in the OTT space affect on-ground exhibition of feature films? India, I feel, is a country with tremendous opportunities (for growth). The Government’s digital literacy drive, rising disposable incomes, reduced mobile data charges and cheaper smart phone devices have led to a great demand for online entertainment. I think this is just the beginning of the digital revolution in India, and in the coming years we would be leaders in the world market too. Films are and will always remain the staple entertainment diet for every Indian. The unfortunate fact that movie theatres across India lack basic facilities would encourage audience to watch their favourite superstars online. But this will also push the cinema owners to upgrade their properties to remain in the game. So the explosion of the OTT space is actually a win-win for everyone in the entertainment space. What are the growth opportunities and challenges you see with reference to the film production business in Eastern India? The opportunities, first, then the challenges, and how you would go about solving them. Your advice as an Industry leader. I feel Eastern India is still far behind compared to other regional film markets, particularly southern India, in terms of box office numbers and footfalls. And therein lies opportunity too. With more than 250 million Bengalis across the world, we definitely have huge potential. But it’s not an easy road ahead. There are many challenges like lack of screens, shortage of fresh talent and original content ideas, and shortage of passionate content creators, to identify a few. And all of these need long-term solutions, and we as an industry need to address them together. Everything cannot be changed overnight, but looking at the huge opportunity, it’s time all stakeholders address the issues urgently and together. How is the feature film business doing in Bengal and Eastern India? Can you give us a thumbnail sketch of what the movies subsector is like in Eastern India today? The main players, the market shares, the turnovers…? To be honest we are at the lowest point! In in my last 22 years I have never seen such heart breaking box office numbers for Bengali films — especially for commercial films targeted at rural audiences. The urban mainstream is still doing comparatively better, but it has the potential to be much higher. Since box office data is not shared or available at public platforms I really can’t give you exact numbers, but my guesstimate pegs the size of the Bengali film industry at around 150 to 200 crore Indian rupees. … and there are really no major players apart from you. What is your market share like? You also have a distribution arm with cinema halls. What is that space looking like for you? When and how did you start and grow it? SVF Distribution is vertically handling the distribution of Bollywood and Hollywood films in East India. The inception happened with the film ‘Bombay’; since then, SVF has distributed over 1500 Hindi and English movies in the circuit, making ours the largest distribution house in Eastern India. In addition, we have had successful partnerships with a majority of production houses in India such as Reliance-Phantom Films, Fox Star, Sony Pictures, Viacom18 Motion Pictures, Disney, Red Chillies Entertainment and others, which have made our distribution vertical one of the strongest in India. The quality of the viewer experience is something that drives consumption everywhere, whether on-ground or off. Like a jerky, buffering viewing experience on OTT, a bad movie-watching experience in a cinema hall too can put people off forever. Is that true across the interiors too? Yes it’s very true. I can share a very personal experience. We used to travel a lot, earlier, during our releases to remote parts of Bengal to understand the audiences. During one such visit, a young boy asked me, ‘Why is it always raining in the movie?’ After a moment I realized he was saying that because they only got to watch films with old prints which, due to scratches and mishandling, created a ‘raining’ affect. And from there we got the idea of installing digital projection and Bengal became the first state in India to become 100% digital! What are the other need-gaps in the cinema exhibition business and setup in Eastern India, especially in the interiors? And what are you doing to shore up your own exhibition vertical in the movie business? Oh the gaps are huge. The screen count is low — below 200. There are 1 million-plus towns with no screens at all, can you imagine? And we at SVF are very aggressively looking at this. We have already opened 10 screens in the past 18 months across small towns, and we plan to add more than one hundred screens in the next 3 years. Our next big bet, apart from Hoichoi, is definitely exhibition. We are completely focused on the revival of the exhibition business. The OTT space, and even the mass TV channels now, constantly need greater amount of differentiated and exclusive content. Do you see a growth in the potential for film production in the Eastern Indian markets? I don’t agree that TV channels want differentiated content; they only want content that will give them ratings, and that is fair. In the OTT, space being a creator is the first requirement, along with the ability to create different and disruptive content. Yes, we also need to be aware of what is going behind the pay wall and what is AVOD, and accordingly pitch and create content. One hears that you have decided t o increase the number of films SVF will produce this year by as much as 50%. Is that correct? Yes. How else do we satisfy the ever increasing demand? We have announced a slate of 25 films upcoming in the next two years. In fact we might end up doing more. What have been the most popular genres of movies on the theatrical circuit in Bengal and East India? There is no one genre, really, but of late, detective and thriller movies have proved to be a safe bet… Byomkesh, Feluda, Kiriti and Shobor have been made almost every year, and all of them have done good business. What about the most popular genres and titles in that other massive market, Bangladesh? Are you doing something especially for the lucrative market? Getting local talent… shooting there…? Bangladesh is a huge market, but you might be surprised to know that we cannot release Bengali films there due to the government’s ban on Indian films. The only way to release a film there is to make a joint venture or some exchange format. I am really surprised that Indian films can be released in Pakistan, but not in Bangladesh. We must resolve this soon; both governments should urgently address this. It will not only benefit both countries but create a big combined industry which can then fight even Bollywood. Let’s talk about Hoichoi now, which has been up and running for six months now. How has it fared so far? What are your learnings from OTT and how does it work? What kind of content — Original vs Movies vs Catchup vs Music — works best? Yes, Hoichoi is six months old now, and the reciprocation has been really good. Subscribers are spending over 50 minutes daily watching content on our platform, which is really encouraging. Also, the total time users have spent watching content on Hoichoi is above 50 million minutes! On OTT, most of the new internet consumers want to consume content in their local language. According to an industry report, there would be around 42 million Bengali internet users in India by 2021, second only to Marathi internet users at 51 million amongst all Indian languages excluding Hindi. Adding to that the fact that 45% of time spent on mobile is for entertainment, and Hoichoi is well positioned to capture the market as the world’s largest digital content platform exclusively for Bengali entertainment. When you launched Hoichoi, you had an impressive array of original content which included miniseries and dramas. And now you also have an Hoichoi Original Film. Tell us about it. Yes, there have been viewing trends that gave us the confidence to introduce new categories like the Hoichoi Original Film. In fact, the first is already streaming now. It is called ‘Shrimoti Bhoyonkori’, and is the story of a simple man, Binay, who is attracted to his senior, Gayatri; however, he keeps avoiding her in person. Soon there will be Hoichoi Shorts and Hoichoi Documentaries too. Users demand these; however, Original is always a ‘plus 1’ as the thirst for fresh and unique content is higher due to the users’ creative bent of mind. Let’s look back at the past 20 years now. Exactly how many feature films have you produced, which top actors and other talent have you introduced, what are the major awards you have won… ? SVF Films is now the largest production house in Eastern India with more than 120 films to its credit and counting since 1996. Apart from winning coveted National Awards several times and bringing home Filmfare’s ‘Black Lady’, our films have also won the Centenary Award, the Silver Peacock and the Golden Leopard. Our YouTube channel has hit 1 million+ subscribers, so we’re waiting to receive the Gold Play Button as well. One of our productions, ‘Chokher Bali’, is a nationally and internationally acclaimed film which defied language barriers to became one of the finest films from Eastern India winning National Awards for Best Feature Film in Bengali (2005). This was followed by SVF’s debut Bollywood production, ‘Raincoat’, which again went on to win the National Film Award for Best Feature Film in Hindi (2005), along with ‘Memories in March’ (Best Feature Film in English, 2010), ‘Chitrangada’ (Special Jury Award/Special Mention, 2013) and ‘Chotoder Chobi’ (Best Film on Social Issues, 2015). Films like ‘Chokher Bali’, ‘Raincoat’, ‘Iti Mrinalini’, ‘Memories in March’, ‘Apur Panchali’, ‘Chitrangada’ and ‘Rajkahini’ have been part of official selections at international film festivals in London, Berlin, Locarno, Dubai, Shanghai and New York. SVF’s ‘Meghe Dhaka Tara’ was honoured with the Centenary Award at the Indian Panorama, 2013. We have distributed almost 1500 films, including blockbusters like ‘Dangal’, ‘Sultan’, ‘Dabangg’, ‘Padmaavat’, ‘Secret Superstar’, ‘Ghajini’, ‘Revenant’, ‘Ae Dil Hai Mushkil’, ‘Kahaani 2’, ‘MS Dhoni’, ‘Kaabil’, ‘The Jungle Book’, ‘Kapoor & Sons’, ‘Neerja’, ‘Airlift’, ‘Drishyam’ and ‘Golmaal Again’, among many others. And how has your Televison content production fared? Well, SVF has produced over 20,000 hours of TV content with shows like ‘Potol Kumar Gaanwala’, ‘Bhutu’, ‘Mahanayak’, ‘Maa’, ‘Bojhena Shey Bojhena’, ‘Goenda Ginni’ ‘Premer Kahini’, ‘Gopalbhar’, ‘Aamloki’ that have aired or are airing on top Bangla channels like Colors Bangla, Zee Bangla and Star Jalsha, and have become household names. What has been the one biggest achievement in the professional space that you are truly proud of and satisfied with? Which top actors and other talent have you introduced? At one time, the Bengali film industry used to be a very strong film market, but after the death of Mahanayak Uttam Kumar, it went downhill and was almost insignificant at the time we arrived on the scene. We are immensely proud that SVF, with the help of its partners,has revived Bengali films and their importance and stature. Though things are still not as good as they used to be with the Bengali film industry, we are living the dream. We have launched some of the biggest names the Bengali film industry has ever seen. Stars such as Jeet, Dev, Yash, Rahul, Mimi, Koushani, Ritika. Directors such as Srijit Mukherji and Raj Chakroberty. Singers and music directors such as Jeet Ganguly and Arindom Chatterjee and lyricist, Anupam Roy have debuted with SVF Entertainment.